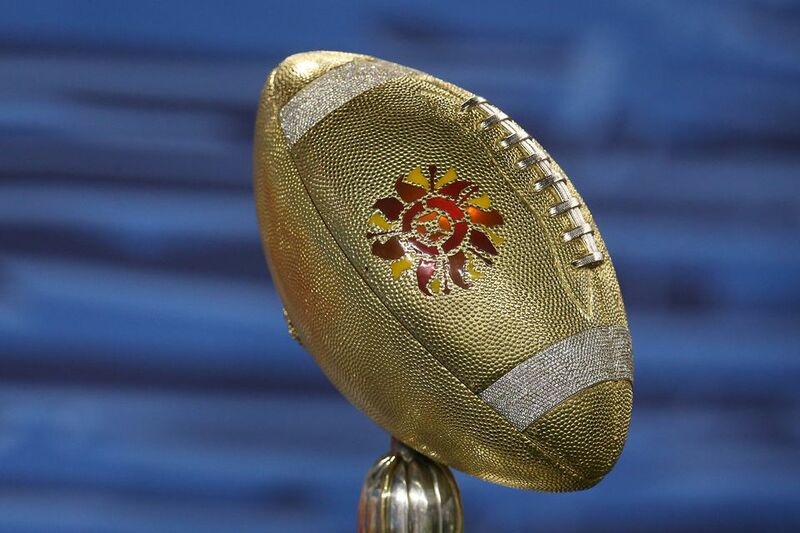 The Fiesta Bowl is one of the most popular bowl games in college football. Want to go to this year's Fiesta Bowl? You can assume that it will be a sellout. The 4Fiesta Bowl will be played at the University of Phoenix Stadium in Glendale, Arizona. The 2014-15 season was the first year under the new College Football Playoff system. This might be the year that you consider becoming a season ticket member. That way you'll get the first shot at tickets for future Fiesta Bowl games. The very first Fiesta Bowl was played on Dec. 27, 1971, and hometown favorite, Arizona State University, won the game. In December 2016, a new title sponsor was named. The official name of the game is Playstation Fiesta Bowl. Playstation will also be the title sponsor of the Playstation Fiesta Bowl Fan Fest pregame party. The Fiesta Bowl will be played on Saturday, December 30, 2017, scheduled for 2 p.m. Arizona time. Can I watch the teams practice when they get to Arizona? Sorry, team practices are usually closed to the public. Yes, it will be carried by ESPN. No tickets for the game? Try one of these popular local sports bars. How do I buy tickets to the Fiesta Bowl? Try the Fiesta Bowl online. Tickets for the Fiesta Bowl are difficult to obtain if you are not a corporate sponsor or a Fiesta Bowl subscription ticket holder. Otherwise, your only shot at tickets may be to get them from a reputable ticket broker like TicketsNow.com, which is part of Ticketmaster. The price of a ticket through a ticket broker will start at around $100 and go up from there. Once the teams are announced and people know they want to go, tickets become scarcer and prices rise. Of, course, you can try buying Fiesta Bowl tickets from scalpers and other online ticket exchanges. Note: beware of fake tickets! See a seating chart for University of Phoenix Stadium. The visiting team (Ohio State) will be on the west side of the stadium. The home team (Clemson) will be on the east side of the stadium. Visiting team seating will generally be on the west side in sections 101-108,201-211, 401-412, and home team seating will generally be on the east side in sections 130-137, 238-248, 444-455. The bands will be positioned in the south end zone. How do I find University of Phoenix Stadium? Here is a map with directions to University of Phoenix Stadium. There are no Valley Metro Light Rail stations close to this stadium. Leave plenty of time—there will be quite a crowd! University of Phoenix Stadium seats about 73,000 fans. Are There Special Traffic Advisories for Gameday? Ticket holders are encouraged to pre-purchase a parking pass. All parking passes must be picked up prior to game day at the Fiesta Bowl offices in Scottsdale. Here is a map of the official parking lots for the Fiesta Bowl. Renaissance Hotel Parking Garage (southeast corner of Americana and Coyotes). Westgate Entertainment District lots (access from Glendale Avenue, heading south on 93rd or 95th avenues) and Tanger Outlet lots (access from Glendale Avenue, heading south on 95th Avenue). There are a limited number of pay-at-the-gate spaces for sale by the Fiesta Bowl in the Gila River Arena lots (access from Glendale Avenue and 95th or 93rd Avenue). If you are driving, plan for the following street restrictions: Maryland Avenue between 93rd Avenue and 95th Avenue will be closed to all traffic except pedestrians and limited shuttle operations. 95th Avenue in front of the stadium will be closed to all vehicular traffic. Will there be a tailgate party before the game? Yes! It's the Fiesta Bowl Stadium Club Pregame Party and it takes place earlier in the day. Where should I look for a hotel room? If you are just coming in for the game and related festivities, you'll probably want to stay at a hotel in Glendale. If you'll be staying in another part of the Valley of the Sun, use this map to get a feel for where you'll be relative to Glendale. What is the weather like in Phoenix in late December and early January? Here are some weather statistics and tips for visiting the Phoenix area for the various bowl games. What if I have more questions about the Fiesta Bowl? You can visit Fiesta Bowl online, or call 480-350-0900.